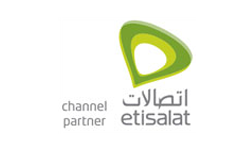 Emirates Telecommunications Corporation, branded trade name Etisalat, is a multinational UAE based telecommunications services provider, currently operating in 18 countries across Asia, the Middle East and Africa. As of February 2014, Etisalat is the 13th largest mobile network operator in the world, with a total customer base of more than 167 million. Etisalat was named the most powerful company in the UAE by Forbes Middle East in 2012.